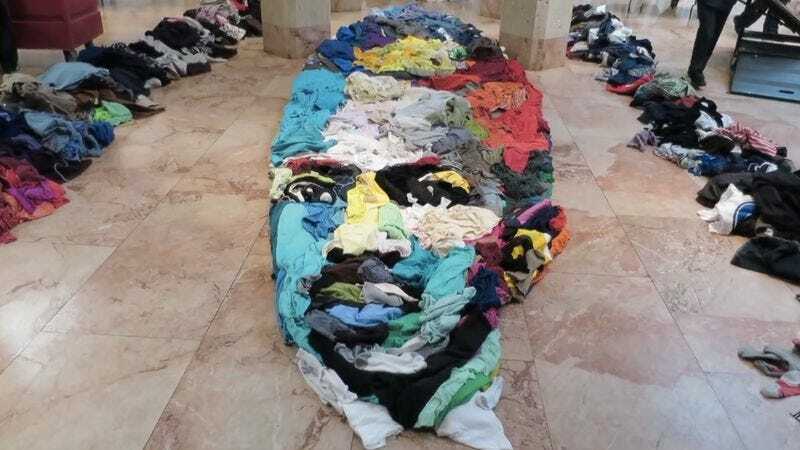 There are very few artists today who are working in the medium of thrift store clothing. In fact, there might only be one. That would be Richmond, Virginia-based sculptor Noah Scalin. He recently went to a local thrift store and picked up a couple bags of used clothes. Then he took them to the Virginia Museum Of Fine Arts, threw it all on the floor, and lo and behold what should turn up by a beautiful anamorphic portrait of James Conway Farley, America’s first important photographer. In the same spirit as the sand mandalas of Tibetan Buddhism, much of Scalin’s works is intentionally temporary or ephemeral. Like our own lives, these works revert back to their component parts or are destroyed after a short lifespan, only to exist in documentation and memories after they’re gone. This is not the first time that the 44-year-old artist has toiled away on a massive project that was ultimately going to be tossed into a plastic bag. Among his many previous art works are a skull crafted from vinyl records, a rocket ship from old punk cassettes, and a portrait of Gertrude Stein from flower petals.